After a very sloppy start, Madras White Buffalos outscore Molalla 46-19 after halftime. 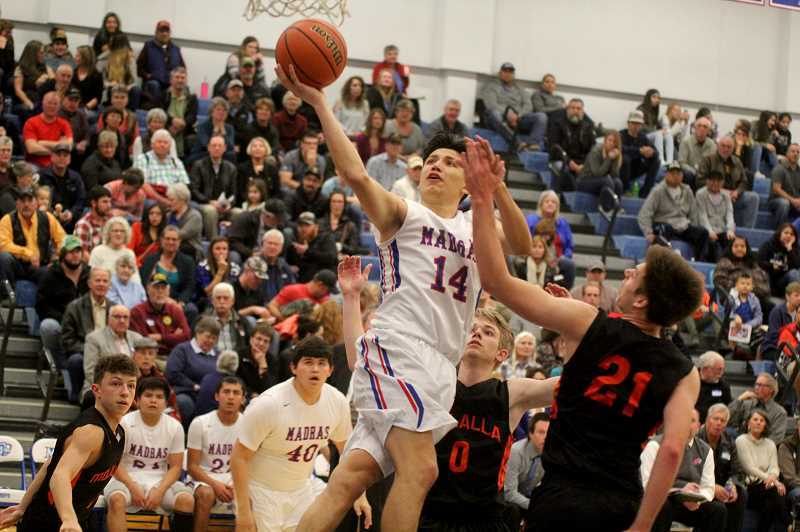 After a poor first half Friday night, the White Buffalos boys basketball team came out motivated and energized in the second hal and blew out Molalla. The Buffs got down early and never could overtake the Pioneers in the first half. But in half two, Madras out-hustled Molalla and outscored them 46-19 to come away with a big 70-47 victory. 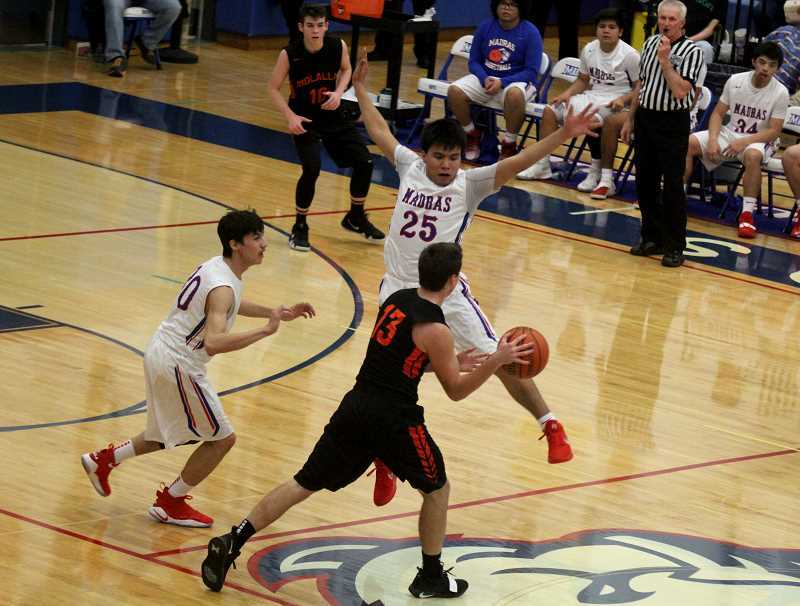 After a slow start, a 3-pointer at the top of the key by Byron Patt gave the Buffs a one-point lead near the three-minute mark in the first quarter, but Molalla push its lead to five, 13-8, at lead by the end of the first. Chapin Grote received a pass from Patt at the corner of the 3-point line and drilled the shot to start the second quarter. A few plays later, a deep three by Dapri Miller made it a one-point game. Molalla was able to get a lot of their points on free throws and were in the bonus a minute into the second quarter and the double bonus with around two-minutes left in the half. A corner three by Derek Main kept the score close for the Buffs. Dapri Miller made beautiful spin move and hit a floater, making it a two-point game, but Derek Pederson made a four-point play, hitting a three, while getting fouled. 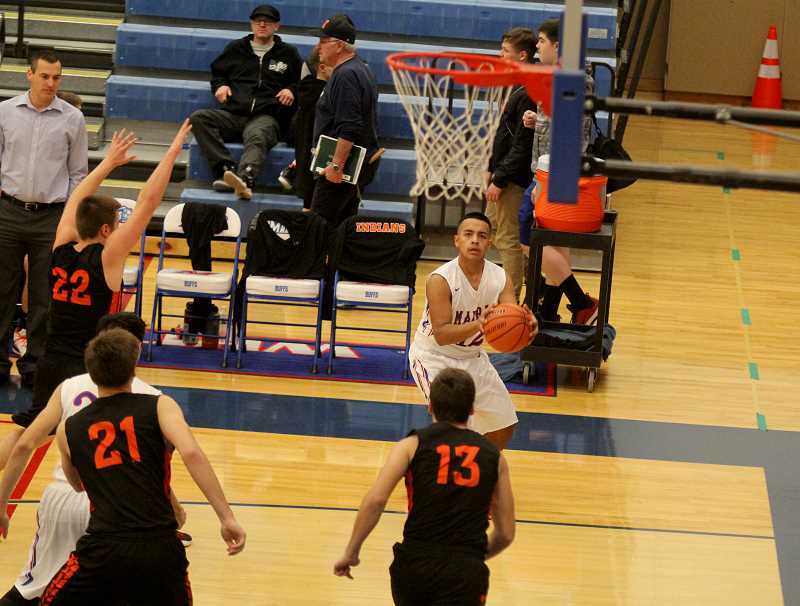 The play was huge and it swung momentum towards Molalla, before Byron Patt drove to the hoop and finished a tough shot at the rim for Madras. The basket by Patt sucked the momentum from Molalla and sent a message that the Buffalos were not going anywhere. Still, the White Buffalos went into halftime down 28-24. Madras entered the second half a different team, an energized, motivated team. Patt started things of with another 3-pointer for the Buffs, but it was matched by Colin Carpenter for Molalla. Grote worked hard for an offensive rebound and putback, but Molalla hit another 3-pointer and extended their lead to seven. A scramble and fight for the ball was won by Grote and he turned a put the ball in the hoop. Some free throws by Kahne Herkshan and Amial Rhoan cut the Molalla lead down to two, but the hot shooting continued for Molalla, making their third 3-pointer of the quarter. Grote's energy not only led to another offensive rebound and putback for him, but started to become contagious as you could see the Buffs coming to life. An assist by Main led to a corner three by Patt and Jordan Mitchel put his head down and drove hard to the rim, giving Madras their first lead since early in the first quarter. A drive and kick from Herkshan to an open Miller led to an easy 3-pointer for the sharp shooter. Miller then assisted on a cutting Mitchel, who finished with a nice reverse lay-in. Madras had one last chance to score with the time expiring and was able to find Rhoan open for a jump shot. The shot went up almost simultaneously with the buzzer and found nothing but the bottom of the net. With stellar defense at the end of the quarter and great ball movement on offense, the White Buffalos took a 48-39 lead heading into the final quarter of play. Molalla scored first in the quarter, but it was answered by steal and floater by Main. Miller hit another clutch 3-point shot and the Buffs had a 12-point lead with around six minutes left in the game. Main stole the ball again and dribble from half court all the way to the rim, finishing a tough shot while being fouled. Main roared and flexed to the crowd after his tough shot, as the crowd roared. The Buffs took a 15-point lead after Main made his free throw. With the momentum, energy and crowd on the the Buffs' side, everyone knew that play sealed the game. The White Buffalos hustled to the very end, stealing the ball and making shots for a 70-47 victory. Patt was the leading scorer for Madras with 17 points, hitting three 3-pointers in the game. Miller was right behind him with 14 points, making four 3-pointers on the night. Grote and Main both ended the game with 11 points, but more importantly, provided hustle and energetic plays that don't show up on a stat sheet. The White Buffalos (2-2 in league) have a home game on Friday against the Corbett Cardinals. Madras beat Corbett 74-61 earlier in the year and needs to do the same to stay in the playoff picture. The game starts at 7 p.m. in the Buffalo Dome.